Why User Activity Log required? Does your website have many users for various admin side activities? Do you stick with issue to track your freelancers, hire developers or website user’s activity on your website admin side? 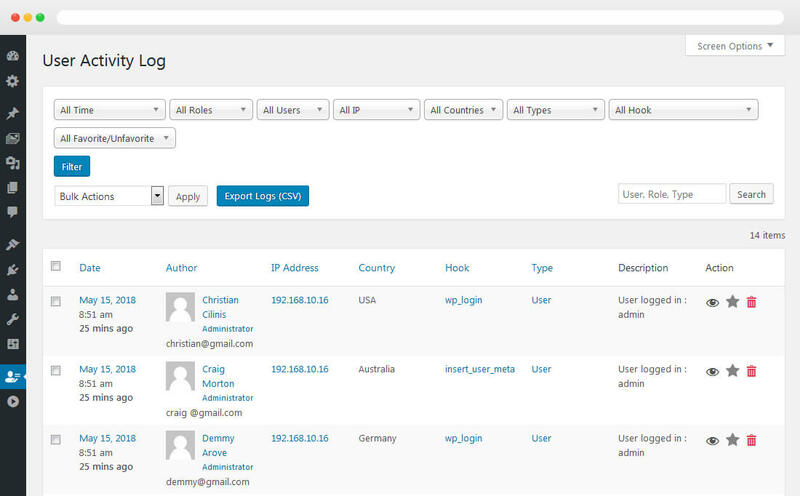 Do you want to secure your site by tracking log of all user activity? Do you want to get notified when a particular user is logged in? Just relax, now with the help of “User Activity Log Pro” WordPress Plugin you can track all users activity on your website. This is the most needed WordPress plugin for all and specially for website owners. 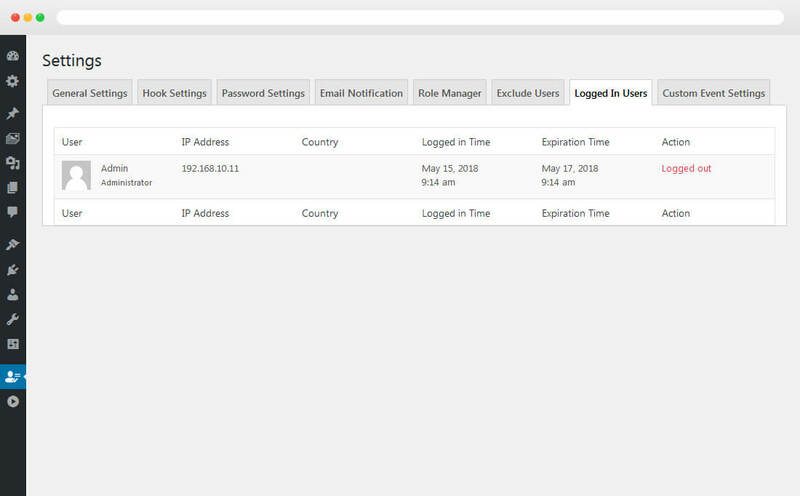 User Activity Log plugin bundled with most needed security features when we have to track users and we will keep adding more in future versions. If your server not providing server logging for your WordPress website then it is a best choice to use this plugin for recording your website activities. Also our plugin recommended by WordPress Codex for logging various activity Under “WordPress Hardening” article. When User Activity Log Pro useful for you? For whom User Activity Log Pro is useful? What makes User Activity Log PRO Outstanding? Sometimes users are thinking about as I can do anything with the website if I have some upper level passwords and no one can track me. But now, you can put they guys as off and feel them as you are also in track-able mode. 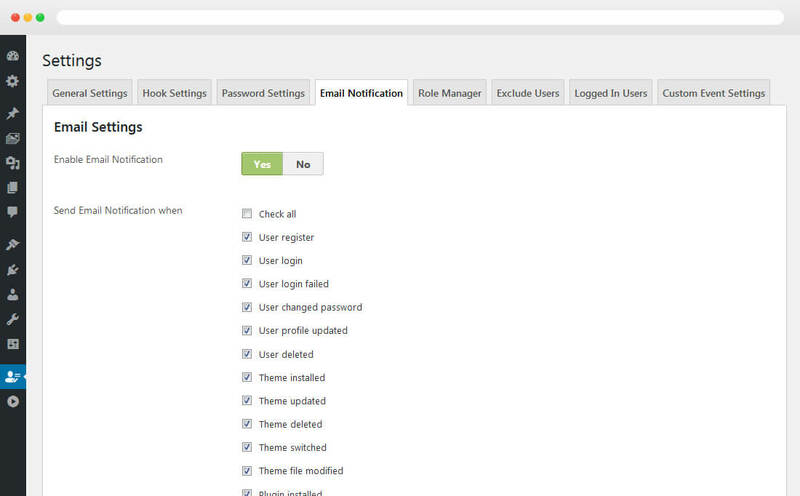 No one single person will miss from user tracking including admin user. If you have already shared your admin passwords to your developer or freelancers. They can’t remove/delete or download that log summary or any single log until they have master password of User Activity log. We are providing high security to care your log data. 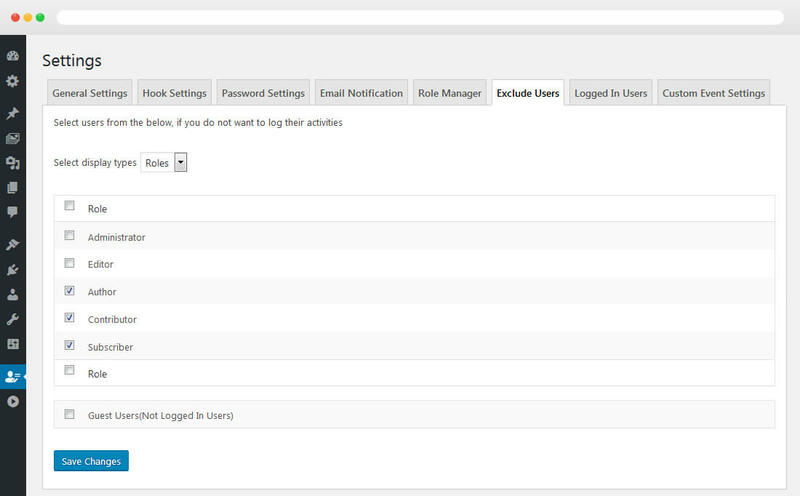 Whenever selected user role’s users are logged in with website then you will automatically notify via email. System will generate one email and will send it to your selected addresses. Sometimes we suddenly notice that our WordPress back-end settings were changed by someone else. When we ask freelancers or developers or other team members, who made this changes? But there is no reply. So how to track who made this changes? Answer is User Activity log PRO report shows all log with details. This is must needed solution required as you want backup of selected log but don’t want to show that log with Activity Log list for another users. You can download your single & multiple selection logs anytime, no copy-paste required. Users need to change some details related to that own profiles and that new details might create an impact on our website like first name, last name, website link, email address, etc. If any user change own user related details then you will also get tracking about that changes. You can set some filter on log from your side as my favorite log and it will be easily accessible for future usage. Who can access the User Activity Log Pro panel? 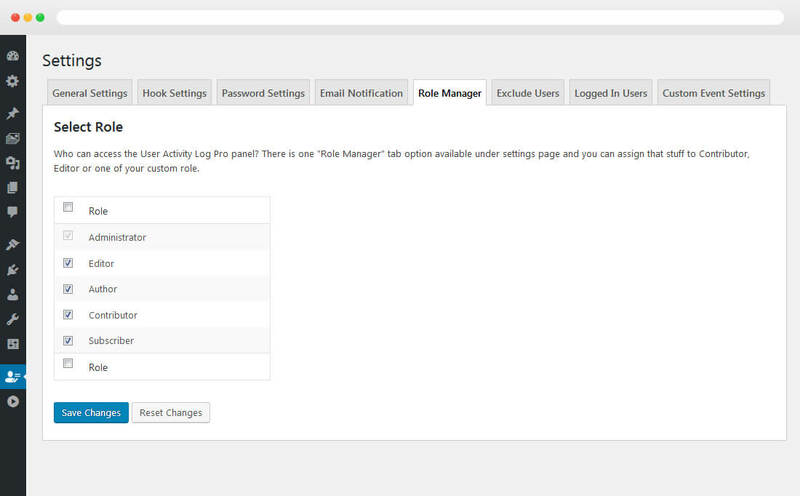 There is one “Role Manager” tab option available under settings page and you can assign that stuff to Contributor, Editor or one of your website Custom Role. You can sort out activity log list based on Date, Author, IP Address, Hook, Type, etc. then you can do that thing easily with ascending and descending order. 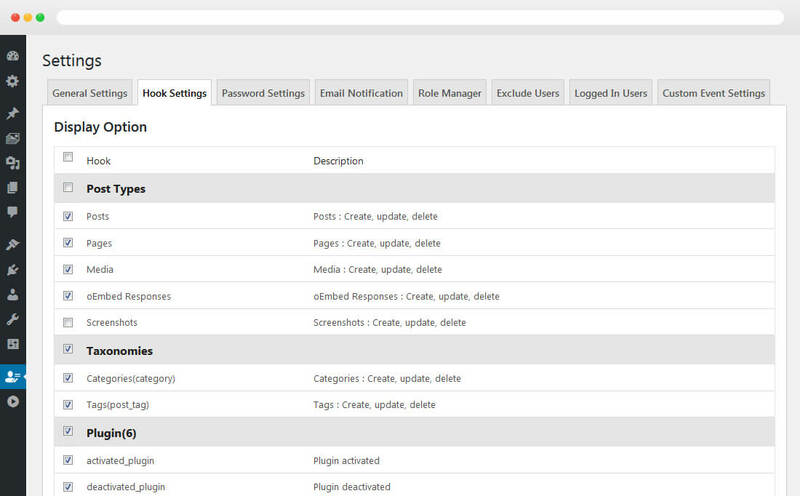 You can filter out activity log list based on Date, Author, IP Address, Hook, Type, etc. same like sorting and one more feature option is available as favorite/unfavorite log. 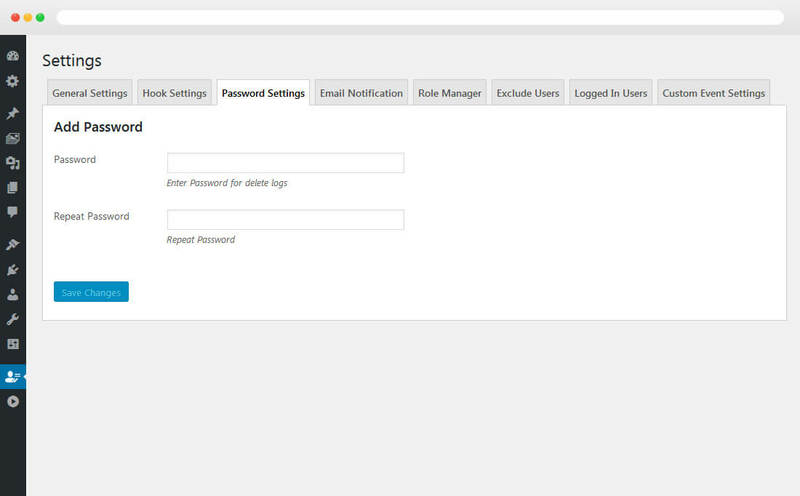 Easiness with backend panel is first requirement of any plugin and we have already understood that thing. So, beginner can also start website tracking. Options to reset your activity data anytime via “Delete Log Activities” option. That will remove your all activities data with download and email option. If you want an instant email in your Email Inbox when selected users or selected user role’s users are Logged-in with website. You can customize your email body too. User Activity Log Pro plugin provides you an option to export log data into CSV file format. So, you can easily read for your next future usage. No need to track all activities? No worry, we are providing large number of options as you can select a checkbox for posts, pages, media, categories, tags, etc. User Activity Log Pro compatible with custom post types and custom taxonomies. You have some custom post types like portfolios, testimonials, etc. and worrying about that tracking then this is a best solution for you. We are familiar with revision post type in WordPress and that will store your all revisions but if you want to delete any one selected revision then you can’t do it. User Activity Log doing that same stuff but you can select for which post type you want to track and only selected post type start tracking with page contents. 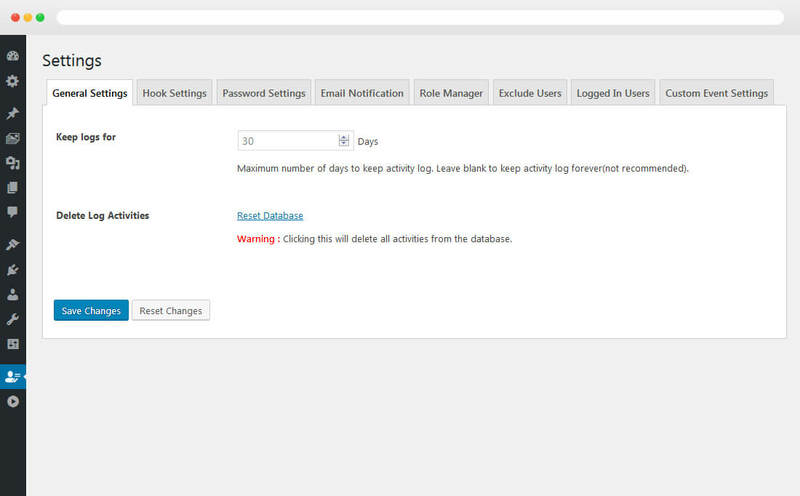 Blog website owners can use User Activity Log Pro as like SVN, github, etc. as project synchronize tool for multiple blog authors. You are really happy with the current plugin’s functionality but still want to add some more stuff from your side. We have already figure out that requirement also and added that support also. There are no limits to add your custom event log entries. 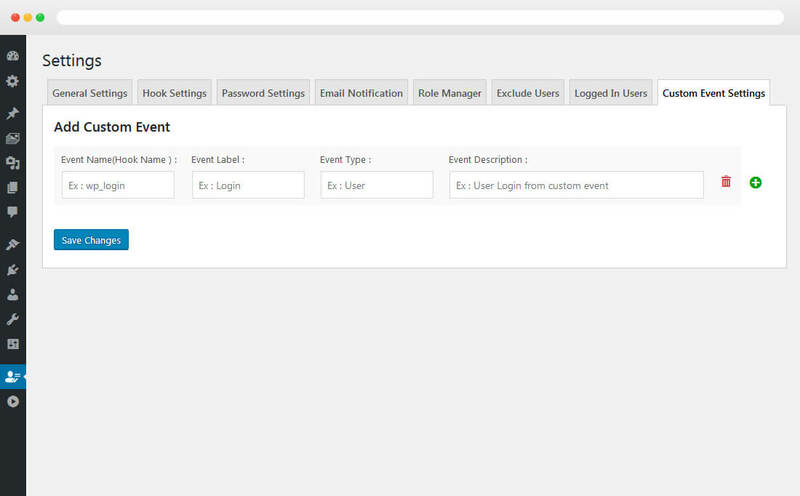 You can add thousands of event hook and can track every one. * Updated: Admin can add multiple emails. * Updated: Added filtering option for country. * Updated: Added 'Logged In' tab to display all the logged in users. * Updated: Added database integration and migration functionality. * Updated: Send Email Notification for different activities. * Updated: Add option to disable guest users' logs. * Added: Admin Dashboard Widget, "Latest User Activity Logs"
* Fixed: Email getting "User Registration Date" instead of "Login Date"